Many times things that we play with in our lab seen to take on a life of their own. So it goes with the Moai. A friend from Metrix Create Space sent us this link to an interesting Gizmodo video about Intellectual Ventures (i.e. interesting in its own right in terms of design concepts, etc). BUT, the real fun occurs at the 1:10 mark of the video. It seems that our friendly Moai appears on top of one of their prototyping machine. 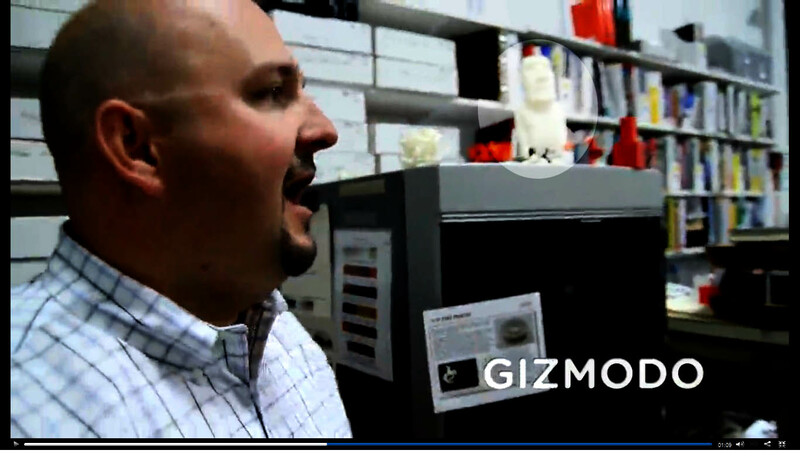 Check it out (oh yes, please watch the video as it shows a nicely tricked-out prototyping shop). Digital copies of Moai are available in several places (Open3dp, Thingiverse, EvoBeach). Let’s have some fun, if you’ve made a Moai (or someone you know has produced a Moai), please send us a link via a comment. Here’s a copy of your moai necklace. I got the stl from thingiverse, made it on a Zprint 310 with 5 year old powder and binder that they told me wouldn’t work 🙂 . I’ve been following your new powders and binders with great interest. Thanks!